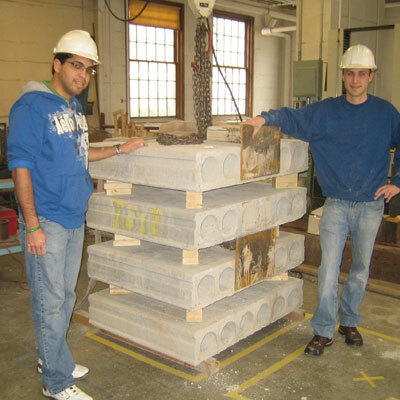 The Structural Engineering and Mechanics Program maintains experimental testing areas for research and instruction in Gunness Structural Laboratory. 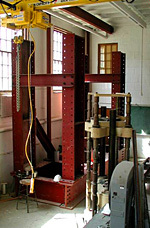 This supplements the analytical and mechanics based research which is conducted in facilities in Marston Hall. The laboratory is outfitted with a full assortment of instrumentation for a wide variety of experimental testing. Instrumentation incudes LVDT’s, linear and string potentiometers, tiltmeters and load cells. Several ongoing research projects involve a large amount of field instrumentation and data collection. Bridge data has been collected using Campbell Scientific units with GeoKon instrumentation and Bridge Diagnostics equipment for bridge load testing systems. Computational facilities support students performing research in the Structural Engineering and Mechanics Group include access to the full range of services supported by Engineering Computer Services. These include computer laboratories with windows and macintosh computers and a broad range of general use software. Additionally, the group maintains high speed, multiprocessor workstations running the linux operating system that are available for student performing computationally intensive research. Access to additional cluster computing environments on campus can be arranged for specific projects. The suite of specialized structural engineering and mechanics software available includes Ansys, Adina, Matlab, Mathematica, Risa, SAP and STAADPro.